Merging education and real-world experience. It doesn’t get more hands on than this. The Ashcroft Design Challenge in partnership with Lethbridge College provides students in our Interior Design Technology program the chance to design a home from the ground up – then bring it to life. Winning students have the opportunity to intern with Ashcroft Master Builder as the company builds the home. Students in their first year of the Interior Design Technology program are tasked with creating an original design that reflects modern, urban living in Lethbridge. Once they have their design, the first years are partnered with a second-year student who brings the design to life in virtual reality. Ashcroft Master Builder then takes it a step further, selecting the winning design and, in partnership with their trusted trades partners and suppliers, taking it from virtual reality to reality. The winning students have the opportunity to intern with Ashcroft as the home is being built. They see their design come to life like never before. And at the end of it all, the home is sold with a portion of the proceeds returning to Lethbridge College. It’s a cycle that continuously supports the next generation of interior designers. Like any great idea, the Ashcroft Design Challenge started small – a single thought that sparked excitement and roared to life over five months of discussions, planning and collaboration. Ashcroft is no stranger to supporting the next generation of designers and trades workers. 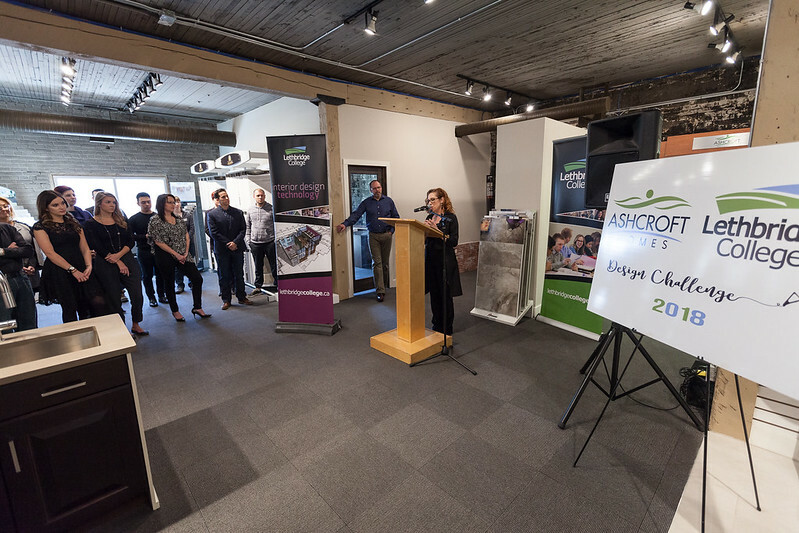 Known for a philanthropic company profile that gives back to the community, Ashcroft was one of the first builders in the College Home Project, which raised nearly $1 million for the Trades, Technologies and Innovation Facility. As that project came to an end, Ashcroft looked to continue a partnership with the college. An idea was pitched, and over five months it evolved into The Ashcroft Design Challenge. The Ashcroft Design Challenge officially launched on Thursday in partnership with Lethbridge College. First-year IDT students will come up with an original home design that is unique, innovative and reflective of what modern living in Lethbridge looks like. Those first-year students will then be paired with second-year students who will bring the design to life in virtual reality. Designs will be judged by Ashcroft Master Builder, and the company will then build the winning design, with the designing students working with the team as interns. The winning design will be announced at Lethbridge College Interior Design Technology's surRENDER event on April 25. Finalist #1 - "The Ryker"
Finalist #2 - "The Emberly"
Thank you to all the trades and suppliers who are making this project possible. For more updates, follow Ashcroft Master Builder Ltd. on Facebook.